Heinrichs Developments is preparing to introduce a refined addition to Abbotsford’s Mill Lake neighbourhood with Mill District. This premier collection of 82 condo residences is coming in early 2017, and will offer a rare opportunity for parkside living in an established and central community. Designed by award-winning architect David Tyrell, homes at Mill District will be incredibly spacious, with one- to four-bedroom plans ranging in size from 684 to 1,655 square feet. Warm-toned interiors by i3 Design Group will offer maximum functionality and create a timeless, sophisticated feel, while an intelligent blend of traditional and contemporary features will add understated elegance. Mill District’s unparalleled location next to beautiful Mill Lake Park will be an additional benefit for residents. Acres of parkland with walking paths, nature trails and serene views will be nearby, providing a close connection to nature. Urban amenities will also be easily accessible at a variety of locations, from farmers markets to the Sevenoaks Shopping Centre. More information on Mill District will be available soon. 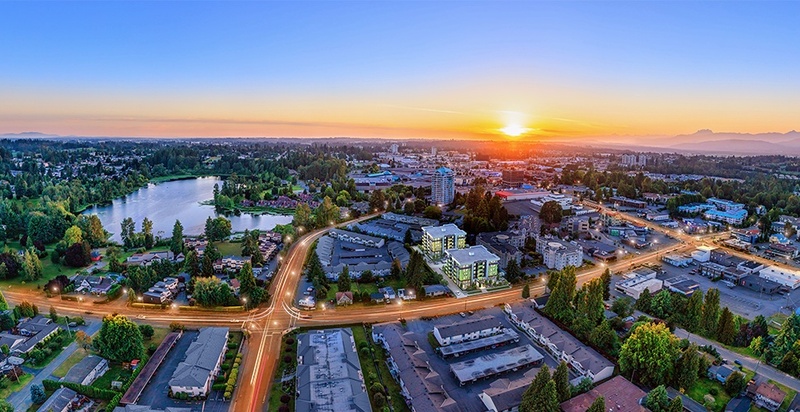 In the meantime, Heinrichs Developments is encouraging interested buyers to click here to register to be among the first to receive updates about this elevated Abbotsford living opportunity. For more information call 604 621 5888, email info@milldistrict.ca or visit the website here.